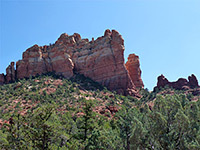 The 2 mile Margs Draw Trail traverses fairly flat terrain on the east side of Sedona, below the rugged western face of Munds Mountain, which is cut by a number of short ravines forming dramatic fins and promontories. 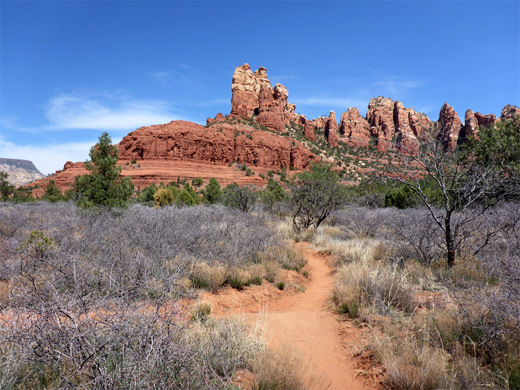 The trail stays quite far from here, however, instead crossing a mix of sandy flats, patches of trees and several minor drainages, while also affording good views of Sedona and other red rock formations to the west. Despite the proximity to town, the path is not so much used, and is a good choice for a relatively quick and easy, child-friendly hike close to the main road (Hwy 179). The path is accessed from trailheads at either end; one, in the north, just before the start of the unpaved section of Schnebly Hill Road, the other, in the south, at the end of Morgan Road. The former is preferred as it has more parking space, and is paved. 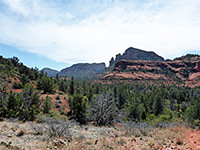 The southern trailhead, at the end of Morgan Road, is rather cramped; unpaved, rocky and uneven, and often completely full, mostly with people hiking the more popular Broken Arrow Trail, which explores a valley to the south. 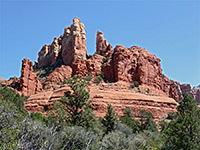 The northern trailhead, one mile along Schnebly Hill Road, can also be full at popular times, though overflow spaces are available on nearby verges. Other routes starting at this location are the Huckabee Trail northwards and the Munds Wagon Trail east. Margs Draw Trail can also be accessed via a short link path from Sombart Lane, which joins the main path about half way along. 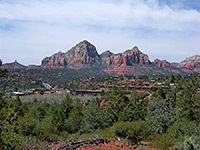 In the north, Margs Draw Trail is accessed by walking 800 feet west along the Huckaby Trail, starting from the northern end of the car park, then turning left at a junction; the path immediately crosses Schnebly Hill Road, where it is marked by a small sign, then heads generally southwest through typical Sedona lowland landscape of sandy mounds, rock outcrops and little ravines, covered by pinyon and juniper pines, Arizona cypress, yucca, agave and cacti. Another sign indicates the boundary of the Munds Mountain Wilderness Area. 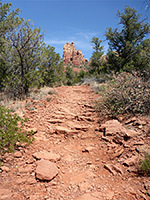 The path crosses a few dry washes while moving round beneath the northern arm of Munds Mountain, split into several orange/red fins above smooth slickrock slopes; a formation known as Camel Head. The land then flattens out and becomes largely free of trees, sloping down slightly to two, closely-spaced junctions; the first is with an unofficial eastwards path to the base of 'Snoopy Rock', a shapely red sandstone formation, the other with the Sombart Lane spur from the west. A short distance beyond is the wider streambed of Margs Draw itself, also usually dry, with a small pouroff just downstream, sometimes harboring a pool at its base. 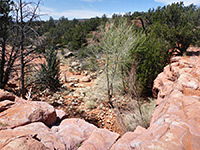 The terrain stays sandy and exposed for a while, habitat for quite a few different flowering plants in spring and early summer, until the trail descends slightly to another pair of dry creekbeds, where the trees return, and the route ends with a slight climb to the Morgan Road trailhead, close to a residential area.